Enroll in the Testmasters FE-CBT Chemical Online Course for only $999! All class manuals included in course fee. All teaching done from these notes. Convenient: Watch Classes from Home. Materials Science, Strength of Materials, Dynamics, Statics, Computer Science, Engineering Economics, Ethics/Professional Practice, Probability and Statistics, Mathematics, Fluid Mechanics, Computational Tools, Electricity/Power/Magnetism, Thermodynamics/Heat Transfer for OD, Heat Transfer for Mechanical and Chemical, Measurements and Instrumentation, and Mechanical Design and Analysis. 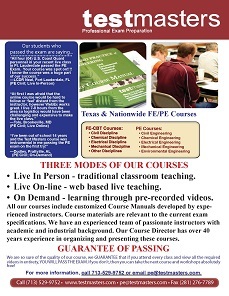 Test Masters guarantees that if you watch and understand every class, you are guaranteed to pass the FE-CBT Mechanical Exam. If you don’t pass the exam, you may take the online course again, absolutely free of charge.